Wandering around the outskirts of the set for the new Batman film, we ran into the escaped convicts who are being used in the prison break scene. There are few things more unusual and/or terrifying than watching a large crowd of burly, imposing men in full prison garb being outfitted with machine guns. I guess it was more terrifying when one of the AK-47-wielding inmates yelled at us for filming them. Large explosion in the Jailbreak where Bane is delivering his manifesto! A tumbler with the old Batman Begins camo pain job getting prepped and rolling on city street to the Pittsburgh set of the Dark Knight Rises. But is it a Batmobile like everyone assumes, or might it have some connection to the camo-clad men photographed with Bane? According to the Pittsburgh Post-Gazette, the Lawrenceville set doubled as the home of a Gotham City judge (played by Brett Cullen) and Gary Oldman’s police Commissioner Jim Gordon ran up the house’s steps in take after take to alert the judge to dirty dealings and increasing violence in Gotham. 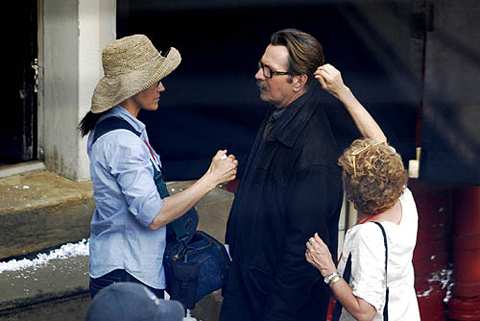 The new set photos and videos IGN assembled from The Dark Knight Rises location shoot in Pittsburgh is dominated by fan and photography websites, but some of the most interesting pieces are credited to professional journalists at an honest-to-god newspaper. Such as this first look at Marion Cotillard as Miranda Tate from The Pittsburgh Post Gazette. According to the Post Gazette, this is the Lawrenceville set, converted into a wintertime scene with snow and wind machines to create the impression of a storm. Small consolation for Ms. Cotillard dressed for winter in one of the hottest days of summer. Cotillard is new to the Dark Knight ensemble, but is a Nolan alum from 2010’s Inception. One of the more interesting pics to emerge from Just Jared’s collection of photos from The Dark Knight Rises location shoot in Pittsburgh. This one reveals Tom Hardy as Bane in his full costume. 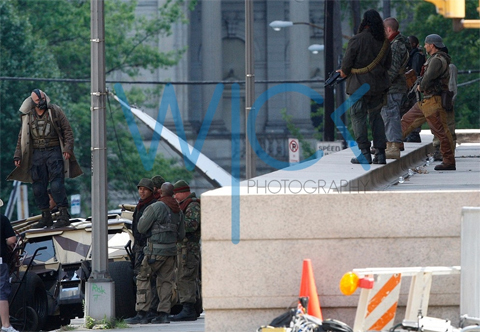 More Bane with men in camouflage and a tumbler which may or may not be the Batmobile from IGN’s new collection of set photos and videos culled from Wick Photography, Batman-News, Latino Review, and Just Jared giving us a substantial glimpse into The Dark Knight Rises location shooting in Pittsburgh. These photos were taken at the Carnegie Mellon University Software Engineering Institute location. 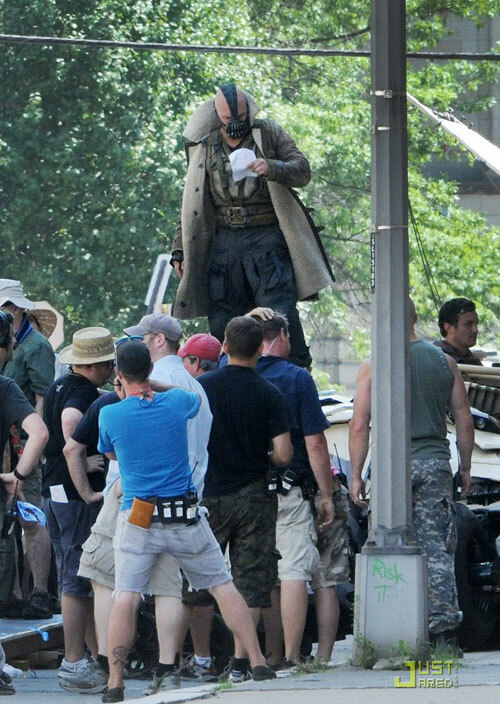 Photos like this one show Tom Hardy’s Bane standing atop one of many Tumblers that have been seen around the site, as “armed” extras dressed in quasi-military garb look on. The less said about IGN’s speculation about what they’re seeing, the better.